Liu and Takeda are back with their Asian fantasy epic, Monstress. Another issue full of mystery, action, suspense, and gorgeous artwork that you just can’t take your eyes off of. We left off with our protagonist, the Arcanic teen Maika Halfwolf, traveling with a little Arcanic girl, Kippa, a talking cat who likely knows more than he lets on, Master Ren, and a kindly human woman named Emilia, who is travelling with her baby. Danger is hot on their trail as those determined Inquisitrixes are still on the hunt, ordered by the Cumaean Mother Superior. However, an even bigger danger is much closer as Maika still battles with the demonic and mysterious hunger inside of her. To start, I really appreciate something that Monstress has been doing to flesh out its world, which is the story summaries in the beginning of each issue and the history lessons with Professor Tam Tam at the end of each issue. Fantasy epics like this one can be hard to follow without going back and re-reading issues every time a new one comes out. 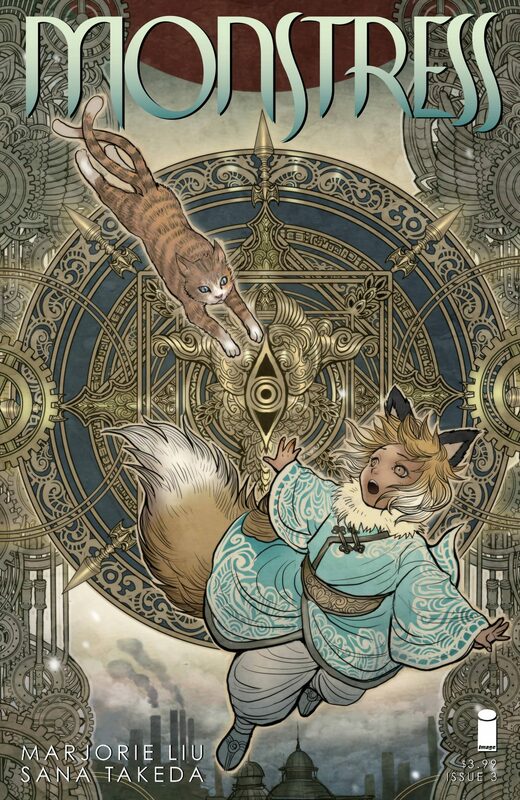 Monstress has done a really great job of always reminding us as readers where we are and what is going on in the story. Besides, all history lessons have something to gain from cute illustrations of cats, I like to think. The issue delves right into the action straight away with a detailed view of the monster dwelling inside of Maika. It is dark and terrifying and even puts off the Inquisitrixes in battle. It speaks to Maika in a way that infers its ancient sense of being and its knowledge of the mask fragment that has been such a mystery to us throughout the story. Ren seems to know more about what this monstrous hunger within Maika could be and we see brief glimpses of the affect Maika’s mother, Moriko, had on the humans during the war and what affect her memory still has on the daughter she left behind. Maika is still determined for answers and decides it would be best to separate from Master Ren, Kippa, and Emilia after she has recovered her belongings (including the mask fragment) that she lost in a fierce and bloody battle with some humans. She is set on finding answers in Thyria, further south, where she will meet with someone who might tell her about the other people in the photograph Maika found of her mother. Liu’s characters are all incredibly unique and a joy is read their interactions with one another in between the conflicts they face. The story never seems to really slow down and the action is always engaging in every issue so far. I love the way Maika asks Kippa is she is afraid of her, and that they share that same fear because Maika knows this monster inside her is slowly taking over her life. Takeda’s illustrations of the eyes in the mountains are truly haunting and are partnered perfectly with Liu’s conversation between Maika and Kippa about whether Kippa’s family prays to them. Kippa asks Maika if it can see them, and Maika, with a face like stone and her mind on a mission to understand things she doesn’t even remember, tells her, “The dead don’t see.” However, we have certainly found in this world that the dead can’t always be counted to be what you think they are. Monstress is easily one of the strongest books coming out right now. It’s full of world building, beautiful imagery, and heavy on badass female characters that you can love, hate, and love to hate. I’m so eager to learn more about Maika and about all of the characters in this book that it’s the first thing I read from my pulls when it comes out The intriguing dynamics of magic and political tension make Monstress a real page turner and a treat to have on your pull list.